I am constantly looking for food that I can order (rather than cook) because I am lazy. I recently determined the perfect order at Panera and answered the question - Is the Grilled Chicken Sandwich at McDonald’s Healthy? 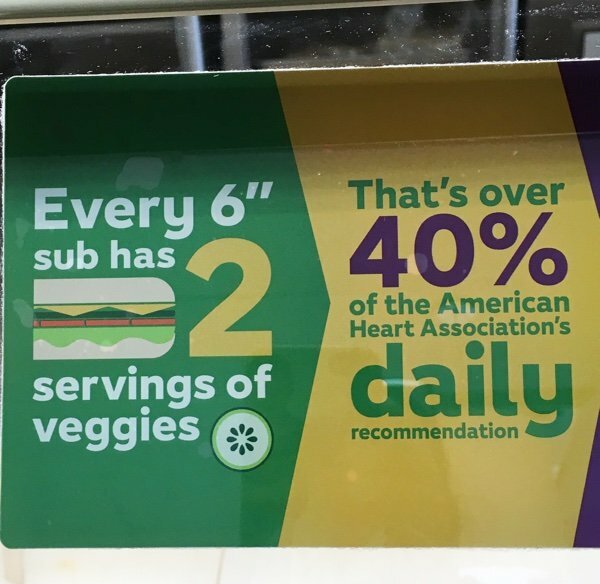 SUBWAY is always ready to tell you how healthy their sandwiches can be as you can see from this above sign. For this to be true – you would have to eat 1 cup of leaf vegetables and ½ cup cut up vegetables (or 1 cup of cut up vegetables). That may be true of some of their sandwiches but there is no way it is true for the meatball marinara or the steak & cheese. I hate it when a sign says “EVERY”. I am always ready to find an exception or two. In my opinion, this should say “MOST” - especially since people order sandwiches without any vegetables on them (like my 10 year old son). I want the Veggie Delight to live up to its promise. The concept, a healthy bread paired with a bunch of veggies is excellent. I have made yummy sandwiches at home with similar ingredients and really love them. As you can see there are a bunch of veggies on this sandwich. On my visit to my local branch, I ordered the sandwich photographed above. 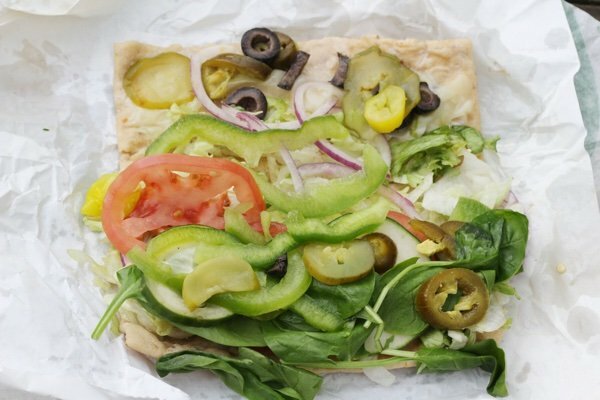 It is the SUBWAY Veggie Delight with their multi-grain flatbread, one slice of cheese (provolone) and all the veggies. I was unable to get an ingredient list at the store - but they provide it on their website and I have posted it below. It also includes 15% of your daily value of iron, 35% of your daily value of calcium, and 35% of your daily value of vitamin C.
And, the store features soda, cookies, and chips to go with your sandwich. I will tell you from personal experience it is REALLY hard to order the Veggie Delight without adding one of these treats. How did it taste? Well, the bread was like play dough (soggy and tasteless). The veggies were good except for the ice berg lettuce which looked as if it had seen better days (like last week). Next time, I will only have the spinach as long as it looks fresh. I think the sodium is out of control but overall you could do MUCH worse than this sandwich out and about. It was satisfying and I definitely got my two servings of vegetables. Take a look at the ingredient list below. I bet you will be surprised to see artificial colors in the food - I was. I decided to look for the positive at Panera. Isn’t it better to see the glass as half full? PROVOLONE CHEESE Cultured pasteurized milk, salt, enzymes. BANANA PEPPERS: Banana Peppers, water, distilled vinegar, salt, calcium chloride, sodium benzoate (preservative), sodium metabisulfite (preservative), yellow #5, natural flavors, polysorbate 80. JALAPEÑO PEPPER SLICES: Jalapeno peppers, water, distilled vinegar, salt, natural flavorings, calcium chloride, sodium benzoate (preservative) natural flavors, polysorbate 80, FD &C Yellow #5. PICKLES: Cucumbers, water, distilled vinegar, salt, calcium chloride, sodium benzoate as a preservative, natural flavors, Polysorbate 80 and Yellow #5. I like Subway when I need something on the go. It's not perfect, but it's a better solution than most places. It's better if you skip the bread and make the sub as salad as well. But sometimes I just need the roll anyway! I usually order either the veggie delight, turkey, or subway club and I always get wheat bread. I am able to refrain from the chips, soda, and cookies. I usually get it to go, so if I need a drink, I grab a Dasani water. If I need a side, I get the apple slices. I eat at Subway about once every two weeks. I don't consider it the healthiest place to eat, but it's a heckuva lot better than some fast food places. I usually get a 6 in. Roast Beef with no cheese, spinach, tomatoes, onions and pickles. Usually I'll ask for just one squirt of light mayo. I either get apple slices or baked chips to go with it and yes, I do get a Diet Coke. I don't drink soda at home, but have a hard time resisting it when I'm eating a meal out. I typically order a 6" turkey and ham on honey oat, with all the veggie toppings and no cheese or dressings. For just under 300 calories, the sandwich provides a good amount of protein (19 grams) and fiber (5 grams) and is satisfying. Some of the ingredients do contain preservatives, but since I don't have Subway (or any other fast food) on a daily basis, I don't feel there is a problem. Remember, all things in moderation. Yes, Subway is selling fresh ingredients, but they aren't selling organic or all-natural. For that, I suggest stopping by the Prepared Foods section at Trader Joe's or Whole Foods. I like Subway. No, it's not perfect, but it's cheap and it's a healthier alternative to just about any other fast-food place. Also, as a vegetarian, I love being able to get a veggie sub that is substantial, not just lettuce and tomato. When I was vegan about 15 yrs ago, Subway was one of the only mainstream restaurants I could eat in. Since I am watching my carbs, I have started ordering the veggie salad instead of the sub. It's yummy and filling. I get a diet Coke (I know, not great, but better than HFCS) or water, and no chips. Also, I love that my kids can get apples with their kids' meal-- and they really do choose apples over cookies, so I must be doing something right! check out the sodium levels, and the veggie deli thing has no protein, not that great. Beware the term "natural flavor." It's often used as a pseudonym for MSG. MSG is not a source of allergic reactions, as is commonly thought. It's a toxin that causes neurological diseases. I do like Subway, and yes, all things in moderation. It is a good alternative to "fast food" and most of the other options out there. Have you checked into Chik-Fil-A? According to a book I read, they are the only fast food restaurant that everything on their menu is under 500 calories...might be another good alternative, if they have them where you live...they do here in UT!! Subway and Chick-Fil-A are alternatives to "fast food"??? They ARE fast food. The food industry wants you to believe that it won't hurt you to eat their food "in moderation." Then they put physically-addictive chemicals in the food to make them irresistable. Who can eat just half a bag of chips? Drug dealers use the same tactics - because they work. I actually get the veggie at Subway as well, but I make a few modifications that would make it healthier than how you had it. I don't get the pickles or either of the peppers (those were the source of your preservatives, etc.). I also do not get one of the flavored dressings. I just get salt, pepper, and oil and a little vinegar thereby skipping the high fructose corn syrup as well. I also see that you didn't add spinach to the list of what was on your sandwich. (However, it looks like in the picture it might have been on there.) Most of the subways I have been to around here (WA) have it as an option. Also, I usually agree with you, but I have to say, skipping the cheese and 'hollowing out the bread' but then ordering a cherry coke while complaining about the HFCS in the dressing is a lot like ordering a heavy meal and then a 'diet coke'. I see it as hard for you to complain when you made unhealthy choices when there were healthier ones offered that you could have made. As for resisting the chips, cookie, etc. just order a footlong. You don't have to actually eat more than a 6" but just getting it will make you think you have no room for the chips, etc. 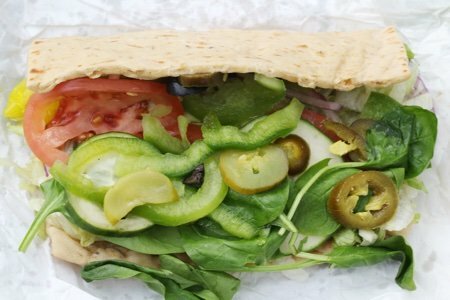 I think Subway has actually gotten less healthier over the years because they want to keep customers from going to Quiznos who I think benefit from the 'healthy sub' commercials of the past for Subway, but are much larger portions, calories, etc. Anyway, I still like that it is an option for fast food occasionally. I actually just had it last Friday, and ordered a water to go with it. By the way, a trick to not order soda is to either think 'this is poison' seriously start thinking 'poison' everytime you think of it and it is instantly less appealing. Also, I often get just soda water (it is usually a side tab you can push on the machine often next to like the Sprite or 7Up option). Great review, I'm a vegetarian and an occasional Subway eater myself and I was surprised to learn there is artificial coloring in the banana peppers. One point I'd like to make to you and your readers is this: Low-Fat and Fat-Free dressings are generally worse for your health than their full-fat counterparts. When Subway's chefs/scientists engineered their sauces and removed the natural fats, they swapped them out for things like high fructose corn syrup and modified food starch. Fat is not the devil, the scientists convincing you of that are the problem. Read the part about how this stuff is modified and you might think twice before getting that sauce next time. Interesting write up. I do agree that Subway IS a healthier option for "fast foods", however, you can order your meal in a healthier way. I use the olive oil/vinegar or spicy mustard and leave out the dressings. Plus you can pick their apples or yogurt for your sides or even baked lays and have iced tea or water versus the other options you list (soda, chips, cookies). If you are opting for a full fat chip, I do believe plain Sun Chips are the CLEANEST they offer with ingredients you can recognize. I AM however bummed to see that they use High Fructose Corn Syrup in their breads :( But, glad to see that their veggies do not contain preservatives (pickles, jalapenos and pepperoncini's naturally contain them due to how they are made). where's the beef? or maybe some sort of protein though? otherwise it is not a meal to me, just saying. I eat at subway often, probably at least once a week. I usually get roast beef, turkey, or roasted chicken on wheat bread ,lettuce, spinach, green peppers and cucumbers. I skip dressing and have them add a healthy dash of oregano. Eh, could be worse...in fact, usually *is* worse! Hey! Don't be a hater about my veggie delight! I love these sandwhiches, but I get them with O & V, & Tea and Baked Lays like mentioned above. I dont care for pickles or the wax peppers, maybe the way they are made is why? Never knew it! I also am bummed, because I cant get spinach at our Subway! Some even have avacodo. Anyway, there is not much to choose from at the fast food places for me to eat! I am still waiting on the BK Veggie review! It really bothers me that Subway is recognized as a "healthy" place to eat. I avoid it as much as I can. Besides, sandwiches taste WAY better at local cafes where the ingredients are fresh and homemade, without added artificial ingredients! Even so, I really appreciate that Subway lists all of its ingredients on the website. Not too many restaurants have such easy access to seeing exactly what is in their food. Don't assume any restaurant or cafe use "fresh and homemade" ingredients, without chemicals! Even if they make their chicken salad "fresh," for example, they're getting their meat from large wholesalers who have already processed the meat with god-knows-what. And "god-knows-what" won't be on the list of ingredients, either! The truth is that you don't know what's been done to your food before it even gets to the restaurant. Bon apetit!